In a 40-minute class, your child will participate in a series of drills and skills that work on developing strength, flexibility, and endurance while increasing coordination, reflexes, and athletic skills. 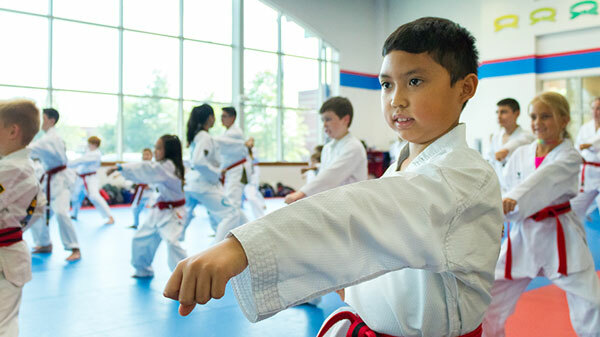 Best of all, your child will love the excitement of learning tae kwon do kicks, forms, and self-defense techniques because no two classes are alike. Kids will look forward to coming to each class, seeing their classmates, and learning from their instructors. Tiger Kim’s World Class staff are experts at motivating children to give their best while keeping class fun. Courtesy. Respect. Cooperation. Commitment. Perseverance. The journey to a black belt is a unique and rewarding experience. As kids move through each of the colored belts, they will learn to set goals, building their self-esteem and self-confidence. Of course, there will be challenges along the way, but our staff is there to help guide them with a “never give up” attitude that will help them overcome the obstacle they are facing. Students will develop leadership skills and build strong friendships throughout their tae kwon do training. These guys are awesome. I can’t say enough about the caring and compassion each instructor has for these kids. I watch as they know each child individually and focus in on what each child or student needs to make themselves better. There is no doubt in my mind that this was one of the best things I could have ever done for my granddaughter. I know that it’s a sport and that she advances, but the other things she learns there from the instructors are so much more valuable than one could realize.